Identification: 15-16" (38-41cm). Bill blackish; legs dark gray. Forecrown chestnut, otherwise brown above evenly and densely barred black throughout; sides of head cinnamon rufous, chin and throat white (conspic. ), neck dark gray faintly barred dusky and becoming bright cinnamon rufous on breast and belly; thighs and flanks olive brown barred black. Sim. species: See duller Highland Tinamou which lacks barring above, is much duller below, and has buff (not white) throat. Also see larger Gray Tinamou. Voice: In Ecuador a chantlike ser. of short, fluttery trills, t’r’r’r’a, t’r’r’r’a,..., fairly high in pitch, for up to 30 or more sec at ca. 3 per 2 sec; song fades at end, often with lower-pitched trill near end. Behavior: As in Highland Tinamou. Status and habitat: A poorly known sp. found mostly outside Venez. Wet montane forest (cloud forest). 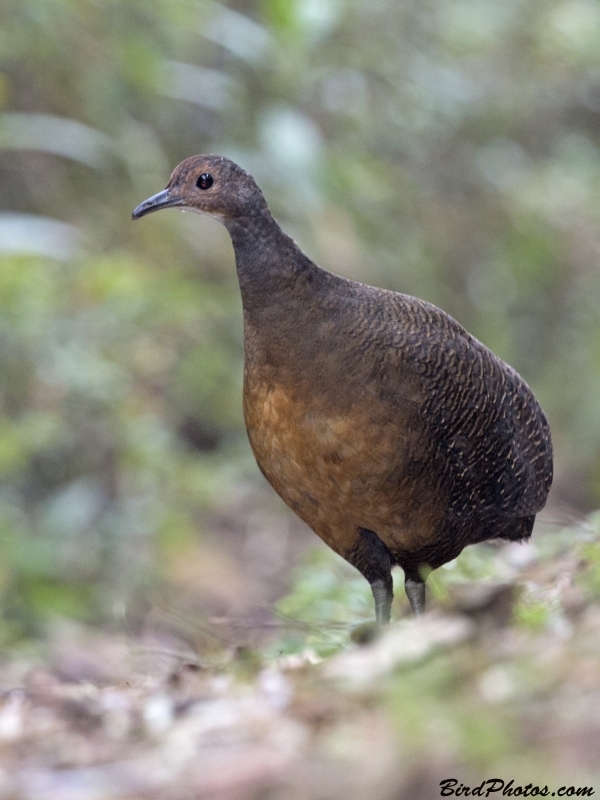 Occurs mainly above range of Highland Tinamou. Range: 2400-2800m. S Tachira at headwaters of Rio Tachira (Paramo de Tama; Villa Paez) and upper Rio Chiquito at Cerro El Retiro. Colombia s in Andes to s Peru.